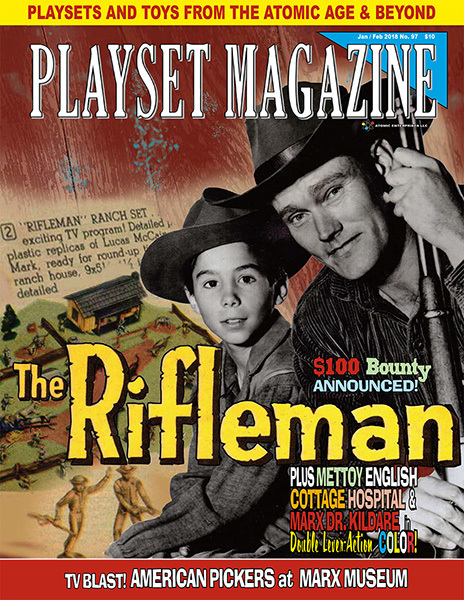 PLAYSET MAGAZINE ISSUE 97: MARX RIFLEMAN! There is a legendary status to The Rifleman, aided by a stalwart figure of the Old West in Chuck Connors whose stern but loving father stars in tales that entertain as well as teach, and whose violence erupted only after a careful, often dangerous build up. 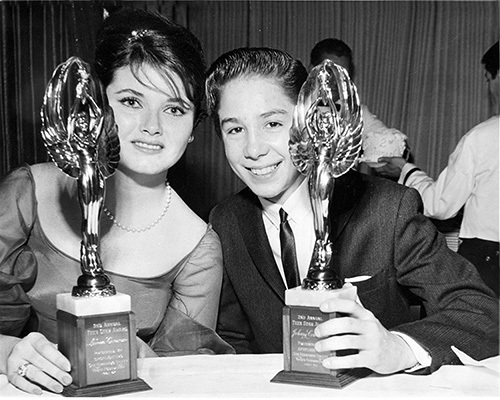 Lucas McCain and his son Mark (Johnny Crawford, shown below after winning his acting award)-- have just bought their small ranch in New Mexico territory, facing not only the trials of living in the Old West, but of the relationships between a father and a son, the towns marshal (the great Paul Fix) and others. Told at a lightning fast half hour pace, The Rifleman aired from September 30th, 1958 through July 1st, 1963 to near universal acclaim. Never in our research is the world “pot boiler” or “Oater” applied – these are straight up dramas and most of them are a marvel of storytelling. In one, Lucas is the victim of a premature explosion that blinds him. There is a chance he will see again, but a killer takes this opportunity to settle a debt and stalks Lucas at his ranch. (The very same ranch that comes in the Marx playset shown this issue!) But Lucas is no mere victim. He has prepared, has made plans. He has placed things within his reach, but the killer catches him outside, in the open. Lucas dives – and finds his famous rifle which he has staged a certain number of paces from the corner of the wagon. As the killer draws, can Lucas reach the corner and from there find his weapon? He can, and does, but the killer must fire first so Lucas knows where he is – and does, blasting away into a new episode. Of course he sees again, that wasn’t the point; its demonstrating careful planning, courage, the will to succeed. These are great shows. Many were personally created and directed by Sam Peckinpah, the guy who would later make Major Dundee and The Wild Bunch. No wonder Marx created what most collectors will agree is their greatest Ranch playset – The Series 2000 Rifleman Ranch, scene of so many adventures, shootouts, in a dry valley somewhere back in the myths of the West. We explore every nook and cranny this issue. Marx packed it full of Western treasures, all in scale and in colors that are realistic and beautiful: Two cabins, cowboys, horses, long horn steer (not often used) ranch accessories, a full rasher of miniature guns, Western parts and pieces; and several Deluxe items available only in this one set: a beautiful Rifleman cabin with porch and two-piece chimney that is considered both rare and desirable; an impressive Rifleman branded gateway, and two character figures in gorgeous cream soft plastic. They look exactly like their real-life counterparts Lucas and Mark McCain down to the folds in their costumes; and there is the possibility for lots of action with the cowboys, buckboard and accessories. This set is far more fun than I thought it would be, and setting it up for photography was a blast. As a neophyte to the whole Rifleman enthusiasm which we explore a bit this issue, it became obvious why Marx made the set, and why exactly collectors love it so much. There remains this great question: Why did Marx make – and advertise – the figure of the boy – who – was – becoming - a- man Mark McCain as carrying a rifle – when in fact he was only released walking empty handed? Why did Marx go to the trouble and expense of creating a mold (shown this issue) and then delete the weapon? We think we have the answer – based upon extensive research with the source itself – in this very issue! We also thank contributors Rick Eber, and those who shared their Rifleman stories with us – Craig Remington, Tom Lowzowski, Bob Jones and others. This issue announces how you, dear readers, can stuff your pockets full of some of PM Puzzler Tom Stark’s Money! That’s right, there’s no strings attached to this way-out Wanted concept! Read how you can win, right here in issue 100! How about that collector-made converted figure that went for sale on eBay, earning $300 from collector’s pockets in bids! It’s a fantastic pose, but what was it? See it this issue and hear from its maker how he did it. 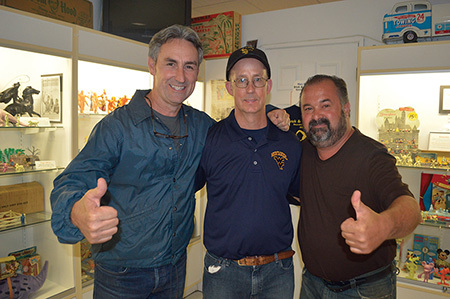 We return to the modern times with a special piece on those two zany American Pickers as they pay a long-overdue visit to the Marx Museum’s Francis Turner and his son Jason (doubtless, the entire family was present for this history making “pick” as they pay thousands to secure a little piece of what the now-closed museum offers! Stay with us as we deliver the true behind-the-scenes story of this fantastic episode in playset collecting history! Do we ever leave it at that? Heck no, this issue of PM is chock full of fun and information. Returning soldiers from the battles in England were dispersed to many locations throughout England, and so many small hospitals and clinics were filled to capacity. For our first steps into the New Year, 2018 you’ll enjoy a rare bit of English hospitality with the English Cottage Hospital, a charming place of care and comfort away from the violence of the Rifleman’s 40-40 Winchester. This gorgeous and vibrant tin litho structure is right off a corner in modern Nottingham and may have supplied help and hope to British soldiers returning from WWII. You’ll also see Marx’ unreleased Doctor Kildare Hospital, a mammoth tin structure fully laid out the Marian way on a beautiful diorama. And speaking of dioramas, join Elnora Nokes for a trip into Buffalo country for a rare and imaginative Indian roundup; and witness the march of over 500 Marx Cadets in a special treat brought by Steve Tsikerdanos. We have a review of the new tin litho Space buildings created and being sold on eBay, and in a its first appearance in our magazine, Fort Pitt as shared by Jordan’s Department Stores and also featuring the Marx PX Military Streetfront, and a small Civil War playset. All this in addition to our New Years full of news, ads, columns and opinion. Join us please for The Rifleman Series 2000 Issue, our first for 2018. And with it, our very best wishes for a Happy New Year filled with health, love of plastics and toys, and prosperity for you and our nation.